The Kingdom is my go-to snobby horror. It’s a Danish miniseries, directed by Lars von Trier. At four and a half hours, it takes is slow, careful time developing a strange, eerie ghost story. I love The Kingdom, and generally speaking, I’m very tired of ghost stories. The Kingdom Hospital remake really pointed out to me the amazing economy of the the original miniseries. There is no fat, no wasted scenes, no overlong belaboring of any points. Everything is there because it needs to be there. That said, it takes a little while to grow on the new viewer. You don’t even see the ghost for the first half an hour. But the story gathers momentum, and becomes an unstoppable juggernaut of creepiness. The ghost story structure is very similar to the one in The Ring (Creepy Moment #5). One character perceives the cries of a child from beyond the grave, and sympathy compels her to help. The story is a mystery, with Mrs. Drusse discovering parts of the past and putting together what happened. Ghost stories are partially about the fear of death, and one of von Trier’s real innovations is setting the story in a hospital, perceived as many as a place of death. But more and more, ghost stories have become about the fear of dying badly. Mary, it turned out, died very badly. Like the standard ghost, she wants to be found and buried. Chilling Moment #1 comes when we find her body. Have you ever seen someone creeped out so badly they ran out of the room? I've watched it happen at this reveal. And this was a television show; there's barely any blood, and there isn't a power tool in sight. To me, this is horror at its best; an emotional reaction elicited not through revulsion or disgust, but chilling horror born of sympathy. Chilling Screen Moments #2: You Want What? The Dr. Who spinoff Torchwood has tried to straddle the line between action and horror, and to my mind, succeeded in being neither. That stopped on the third season, the five-episode miniseries called Children of Earth. This series is concentrated nightmare fuel. The aliens come down, and they aren't friendly. Unlike most Dr. Who-style aliens, we don't see what they are. 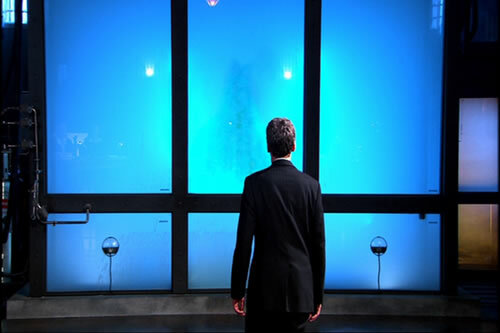 They breathe a poisonous, opaque atmosphere, a very good counterpoint to the "show the monster" in The Host. The aliens are capable of wiping out humanity (shades of colonialism and War of the Worlds), and they can control our children. Children all over the Earth stop what they are doing and start chanting things. It starts with "We are here." In Episode Four, we get down to brass tacks. A government representative negotiates with the alien, who speak with a breathy, synthesized voice. It's good and creepy. But the script really shines as the humans negotiators come to realize exactly what the aliens want. In Episode Five, we learn why, and it's worse than we thought. It is one of the most horrible, chilling revelations I've ever seen put on film. The slow negotiation builds up the tension incredibly well. Brilliant and frightening. I love the Fallout games. They have some of the best stories being told in computer games today. The retro-future background combined with the blasted post-holocaust wasteland is simply excellent. 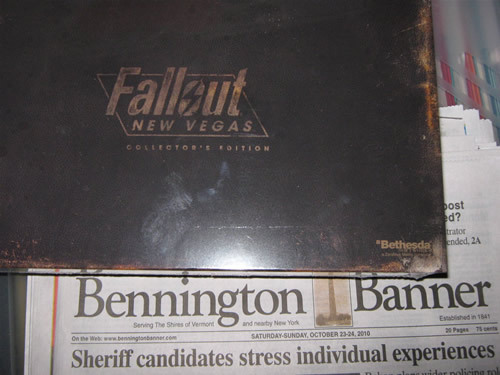 The most recent game has come out: Fallout: New Vegas. Being the enormously geeky fan that I am, I've bought the special edition. And I can't play it. Or rather, won't play it. With Chemistry requiring so much of my time, I simply can't afford to get sucked into a game experience that I know damn well I'm going to love. And so it sits, still in plastic, waiting for me to open it. And it's going to stay that way until the end of December. In many monster films, the driving source of tension is created by allowing the audience to glimpse the monster, never truly seeing it. This works quite well in Cloverfield and Alien. A monster movie truism has been that once the monster shows up on screen, the tension is gone; we know what it is. The Host completely ignores this trope. We get a good long shot as the monster runs past us, in broad daylight, fourteen minutes into the film. Although this is a monster movie, writer/director Bong Joon-Ho knows that it’s not the appearance of the creature that is threatening, but how it acts. With photorealistic CG effects, render farms, and experts at translating concept to screen, it is much easier to create a credible monster than in the past. The film's narrative is much more akin (and this is acknowledged by Bong Joon-Ho in his commentary) to a crime thriller than the standard monster film. A child is in peril, and her family must fight the government as well as the monster’s unpredictability and inhuman strength to get her back. Early in the film, the monster smashes through a crowd, shredding people and creating panic. Park Gang-du grabs his daughter Hyun-Seo and runs, dragging her behind him. He falls, grabs her hand again, and takes off running again. After eight more seconds of panicked flight, he looks back... and he’s grabbed the wrong hand. The girl behind him isn’t Hyun-Seo. We identify the most with human moments, with emotions we understand. Gang-du’s blank expression conveys his stunned incomprehension, and for a few seconds, he’s too shocked to even be horrified. It’s a gut-wrenching moment of loss, and an presage of terrible things to come. 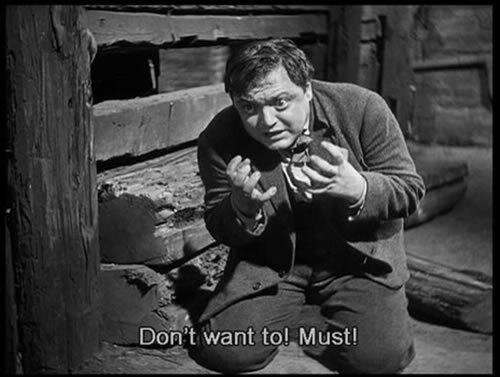 In Fritz Lang's M, Peter Lorre plays Hans Beckert, the screen's first serial killer. Beckert preys exclusively on children, a crime so heinous that the Berlin's thieves, safecrackers, and murderers band together to catch him. And find him they do. Lorre's Beckert is the polar opposite of the modern, urbane serial killers such as Hannibal Lecter or Dexter Morgan. Beckert is tortured, half in denial of the things that he does. His trial, even before a kangaroo court of criminals, finally gives him the opportunity to get it out, even if his audience are likely to be his executioners. The speech he gives defined Peter Lorre's career for the rest of his life, and it's not difficult to see why. Lorre's portrayal runs the gamut from broken to manic in the course of one dead riveting, completely chilling, three-minute speech. Serial killers have become pretty old had old hat, but Hans Beckert's mad, harrowing speech remains a chilling landmark in cinema. Structure is not an aspect of film that is often praised. Yet in a suspense, mystery or horror film, it's vital. Not just that the story itself be interesting, but that it be presented in a way that obscures exactly what is going on while keeping the viewer interested. One of the major challenges to a ghost or monster film is how to build the tension without giving too much away. When should the terrifying entity be shown, and how can it be presented in such a way that it's not disappointing. Very often films fall down when that thing that's been chasing everyone around is suddenly revealed to be a giant carrot, or a dwarf in a rubber suit. The Ring does this perfectly. The tension increases throughout the film, leading to many great, chilling moments. There are three "shock" moments in the film, but they are buttressed with enormous amounts of tension-building subtlety. The mystery is complex and strange, and the investigation is extraordinarily well handled. We glimpse pieces of the ghost's sad and terrible history even as we see the horrifying effects it has on the world around it. 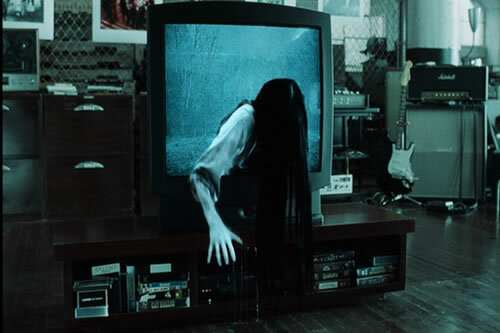 The Ring's story manages to push so many buttons; the images of a child along in a sterile medical environment, cruelty to animals, an isolated community, technophobia, medical testing, the hints that home is not as pleasant as we want it to be. The structure of the film, the way the audience gets hints about what's going on, works beautifully. There is no Basil Exposition telling us what happened. The viewer, like the characters, piece what's going on from interviews, observations, and strange experiences. We get glimpses of frightening consequences without knowing what triggered them, except that there's a videotape involved, and people who watch it die. This lack of clarity gives the story a lot of impetus. This all comes very terribly clear at the end when we watch what happens when someone watches the videotape we have only seen glimpses of. Who we thought was only the victim turns out to be the tormentor, and she crawls out of the television to do her horrible work. It's a hugely chilling moment, as we look at everything we've learned for the past hour and a half in a different light. Anyone can take a bucket of blood and splash it on celluloid. While I enjoy the occasional gore flick, the red stuff is often at the expense of plot and interesting characters. A film (or a miniseries) that spends time and effort on building atmospheric dread interests me more. In the lead-up to Halloween, I present six screen moments that still make me catch my breath. #6: Tokyo in Flames: Godzilla. The original Godzilla is very much a different genre from the daikiaju genre it spawned. It is a disaster film, only the disaster happens to be a giant lizard. Unlike most other films in the genre, this concentrates not only on the giant monster wrecking the city, but what it leaves behind. 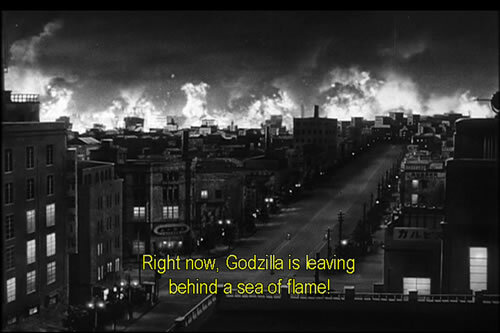 After Godzilla stomps Tokyo, the camera pauses to view the the devastation, and the city in flames. It's a very powerful moment as director Ishiro Honda concentrates on the human suffering in Godzilla's wake. I'm in the midst of nuclear geometry and polar bonds, and I can't think of anything interesting to say. 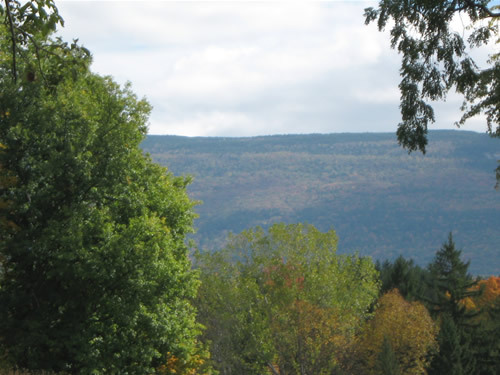 So enjoy my state's prettiness.